It was kind of a more involved, traditional, old-school affair this year -- albeit with some people I had never gone with to this particular event: Shobhit suggested we invite Vinaya, since she works downtown for Nordstrom. Shobhit's cousin Anubhab, who visited during Thanksgiving Weekend last year as well (last year, we joined them for Snowflake Lane in Bellevue on that Saturday -- it was the first time I met Anubhab), was visiting again, and Shobhit figured they could all perhaps join us for this event this year. Shobhit recalled a conversation had last year that they had been to this event last year as well, and I had said something like, "Well I was there too!" 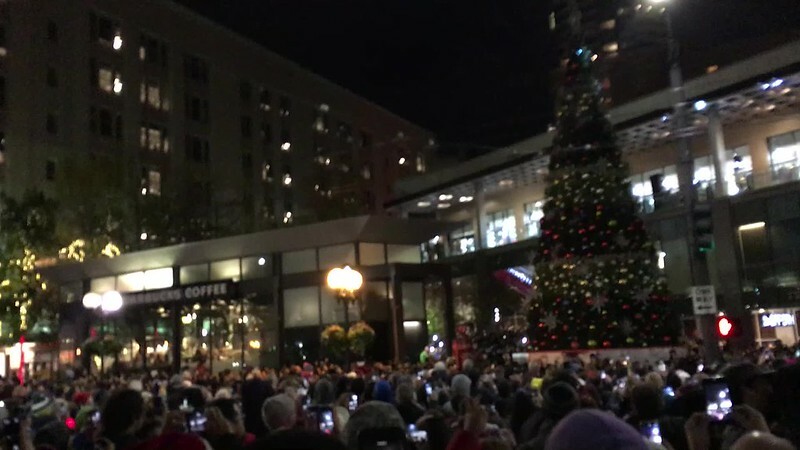 -- but, with later conversations this past Friday, we discovered that Anubhab had simply walked past the Tree Lighting Celebration crowd, not actually stayed for the program. So this really was his first full-on experience of it. Anyway, I get the feeling that as far as Abhishek's family goes, this year it was a kind of one-off for them coming to this -- a local event for Anubhab to see, but Vinaya said while standing in that crowd that she didn't think she'd want to keep coming back for it. As it happened, Abhishek himself, and also their youngest daughter Ishita, were still back in Bothell for most of the day, and planning to meet up in Seattle later in the evening. So it was Vinaya, her and Abhishek's oldest daughter Nikita (who is now, amazingly, sixteen -- I'm pretty sure I first met her in 2007, when she was all of five years old. It's always hard to register how quickly kids grow up: when Shobhit and I got married in 2013, Nikita was eleven; she's now sixteen, and now Ishita -- who was born in 2007 -- is herself eleven. Later Friday night, Nikita was studying for SATs. Much like Karen and Dave's daughter Anita, before we know it, she'll be in college. And I'll be even older. Gah! So at Friday's Tree Lighting event, there were five of us: Vinaya, Nikita, Anubhab, Shobhit and me. Shobhit made samosas and brought them in a container inside a tote to share with everyone while we waited in the crowd. I walked from work, leaving about 25 minutes early; Shobhit walked from home; Vinaya & co. were shopping at Nordstrom and soon enough found us where Shobhit and I had staked a spot to see the Tree Lighting. This event is much more simplified over recent years than it was in the past -- a decade ago, it featured a much longer program, with singing performers and the like. The Downtown Seattle Association scaled down the event in 2016, insisting the decision had nothing to do with recent-year disruptions by Black Lives Matter. (I was always suspicious of a bit of disingenuousness in that statement.) And as it happened, that scaling-down of the event coincided with the first year I was back in town for Thanksgiving Weekend since 2009. But, whatever. They still trotted out Santa Claus, had fake snow, and had the requisite countdown to the lighting and fireworks shot off the roof behind the huge star at Macy's -- as seen in the brief video above. Vinaya had suggested we all either go out to dinner or come back to their place in Bothell for dinner, both of which Shobhit initially resisted -- he suggested we just meet them downtown and share the samosas. But naturally, given we generally see Abhishek and Vinaya twice a year at best, they didn't want to just call it quits after the Tree Lighting event. It probably also made a difference that Abhishek himself was not able to be present at that event itself, and was on his way to Seattle. I made the point myself that it would be too bad to spend so little time after months of not seeing them, and so Shobhit agreed to hang out and wait for Abhishek to arrive. This took around an hour; Nikita had made dinner reservations for five at the Japanese restaurant Hamanasu at 5pm, but managed to change it to a reservation for seven at 7:00. In the meantime, Vinaya suggested we look for a coffee shop or café over at Nordstrom to hang out until then, and Shobhit and I agreed. There was no space at any of the places at Nordstrom, but we wound up making our way across the skywalk to Pacific Place, then back down to the ground floor, and we sat for a while at the Il Fornaio coffee shop on the ground floor of Pacific Place. It was here that I learned not only that Vinaya has only been working for Nordstrom's headquarters for about three years, but she recently moved to an office in a skyscraper in which they are leasing most of the floors, and she works on the 24th floor! This kind of information always excites me, although it's information she's clearly indifferent to -- it took some doing but I finally figured out she works in Nordstrom offices in the 32-story 1600 Seventh Avenue, formerly known as Qwest Plaza, and before that the Pacific Northwest Bell Building -- before around 2008, it dominated the airspace in its immediate vicinity, towering over all its neighbors since its construction in 1976 (the year I was born!). At 498 feet in height, it's still barely taller than its immediate neighbors -- but with Olive 8 (2009) being 455 ft literally across an alleyway from it and Premiere on Pine (2014) being 440 ft just one block away, being taller by all of 43 ft and 58 ft respectively (the equivalents of 3-4 floors) hardly qualifies as "towering" over its neighbors anymore. Not only that, but the 520-ft / 45-story Hyatt Regency Seattle topped out just this year, and that building now clearly dominates its immediate vicinity far more than 1600 ever can anymore. We talked about this and other things as we killed time at Pacific Place. Shobhit bought himself a latte and me a chai tea latte, and we both spiked it with Fireball whiskey he brought in a flask. And then, when the time came, we all walked over to Hamanasu, just a few blocks away. We had to wait for Abhishek and Ishita to arrive before they would seat us, and that took maybe fifteen minutes. Anubhab asked one of the servers to take this shot of all of us at that dinner. Abhishek and Vinaya insisted on covering dinner, which Shobhit really did not want to let them do, but ultimately gave in. I never have trouble accepting such gestures, but Shobhit does -- one of many fundamental differences between us. I honestly think Vinaya has a fair point when she says she wants to since when we last got together Shobhit cooked a huge meal for them at our place (they were the second of six dinners we hosted at home in 2018, coming in April), and so they want to be able to offer something to us. Now don't get me wrong, I'm not saying they "owe us" for that at all -- I'm just saying I totally get the impulse on their end, and it's arguably more polite to accept the generosity than to refuse it. We can certainly invite them over for dinner again sometime, after all -- or do something less formal and, I don't know, spring for pizza or something. I think it may have been Nikita's idea to go to Hamanasu, it being the closest thing to a Benihana's in the vicinity. They wanted to take Anubhab to something he would not experience at home in Mumbai. This definitely qualifies, although it's a curiously "non-American American experience." I mean, going to a restaurant like this is probably uniquely American, to be fair. But, it's also presented as a Japanese experience. I suppose that sort of dynamic could be applied to anything American, really. It was here that we finally finalized plans with Anubhab for Saturday -- he had wanted to experience real snow for the first time, and asked if Abhishek and Vinaya would take him to Mt. Rainier. They weren't really up for that and asked Shobhit if we could take him. I balked at this idea at first because the weather forecast suggested we wouldn't see the mountain at all -- it turned out Anubhab's goal wasn't the mountain anyway, but snow: Snoqualmie Pass was a far easier access point for that than Mt. Rainier anyway. (Shobhit and I should still go to Mt. Rainier sometime: I hadn't realized that, although I have gone there in the time since he and I have gone together, Shobhit has still not gone.) I had already rescheduled plans with Laney for Sunday to free up Saturday, and we established that we would come pick Anubhab up at Abishek and Vinaya's in Bothell, and drive him to Snoqualmie. Shobhit kept trying to push for a day drive to one of the islands, like Whidbey Island, but I kept bringing it back to the snow, which Anubhab had made it perfectly clear was his primary interest. "He's got my back," he said, pointing at me. Shobhit was worried about driving in the snow, and no fewer than three times did I tell him -- all we had to do was turn around and come back if the weather appeared to be too treacherous. And actually, in the end, the weather worked out for us on Saturday spectacularly. Oh, hey! I suppose I should give you links to full photo albums on Flickr if you're interested . 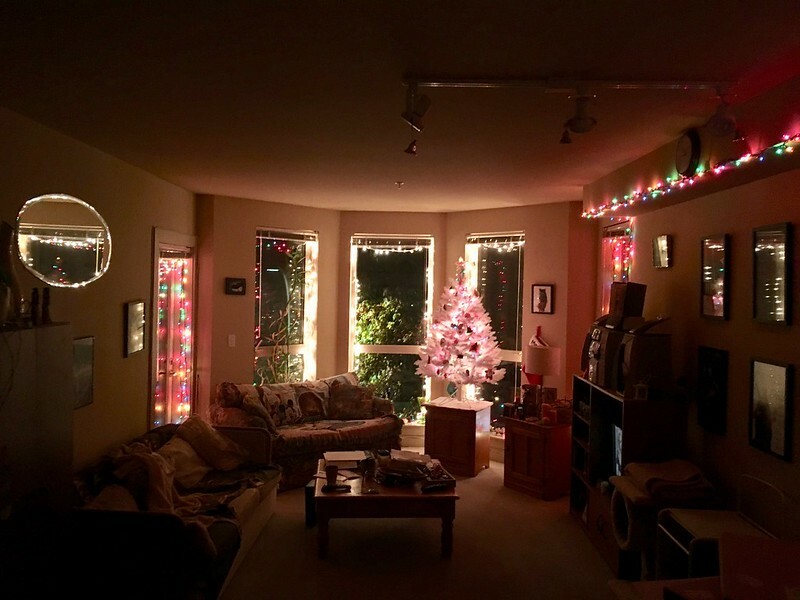 . .
"Seattle Holiday Sights" includes photos of both the Tree Lighting Celebration on Friday and the Christmas decorations I set up at home Saturday night: here. "Snow Qualmie," 46 shots of our Saturday day trip to Snoqualmie Pass: here. I'm still far from finished captioning them all, but they do all have relevant tags on them. Anyway as far as Saturday goes, Shobhit and I got up relatively early so we could get on the road to Bothell by 10:30, be at Abhishek and Vinaya's by 11:00 (where I got this great shot of their front door with giant googly-eyes on it), and then take Anubhab to Snoqualmie Pass and arrive there by shortly after noon. The weather and conditions could not have been better, as it happens -- both in spite of and because of a heavy snowfall at the pass the day before, significant enough to require chains on tires eastbound and even briefly close the pass westbound. That was partly what worried Shobhit. But by Saturday, the weather changed: at the time we were there, the roads were clear and passable; the temperature was 36° and only slightly melting the snow; it was mostly sunny; and there was maybe a foot of snow on the ground -- which was mostly fresh, and thus perfect for playing in for a guy who had never experienced. Now, apparently Anubhab actually asked Abhishek and Vinaya to take him here when he visited last year as well -- and they did, but the weather was very different. There was a little snow, but only a small amount on the ground; none of it was fresh; and it was all gone from, say, tree branches. This visit was much more the "winter wonderland" he was looking for, and he was delighted. As soon as we arrived, he actually said, "This is awesome!" more than once. The ski lifts were not working and much of the "Summit at Snoqualmie" ski resort was closed -- still too early in the season, perhaps -- but none of that mattered. 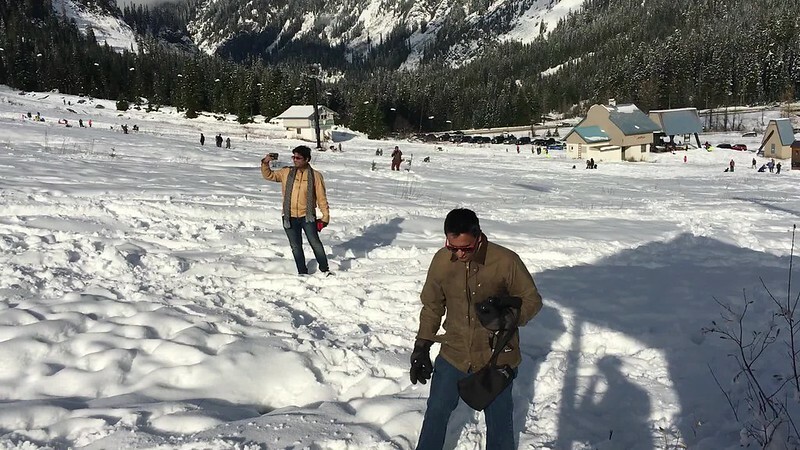 All Anubhab cared about was experiencing the snow, which, aside from the comparatively pathetic version he got to see last year, he had never seen in person before. Between my own photos and the several he took and also sent to me, I got 34 shots of our time spent there -- and even that was only maybe an hour. We did stay in the area for at least another hour and a half, though, first making a brief stop at nearby Snoqualmie Falls (well below the snow line, but still very pretty) and then going out to eat a pretty heavy late lunch at a Mexican restaurant in the nearby town of Snoqualmie. Shobhit insisted on ordering four dishes for us all to share -- two entrees and two appetizers -- which was easily one dish too many, and this kind of practice is clearly why he and I keep gaining weight. We really need to stop that. Two of the dishes were both of a veggie burrito, and we wound up bringing half of one of them home in a box. We drove Anubhab back to Bothell and reached Abhishek's place at probably close to 5:00, and hung out there for at least another couple of hours. Vinaya offered snacks, including some spectacularly masala-seasoned fried pieces of paneer. We all ended up watching Incredibles 2 on their family room TV. It was nice to get to hang out with them all a second day in a row, and although it was a pretty long day for Shobhit and me, it was really fun and I'm glad I was able to rearrange the plans with Laney to make it possible. Shobhit and I drove home, and I had just enough time to go down to the storage unit and bring up the Christmas Tree and the decorations. The elevator was out of service all weekend so I had to walk them all up the stairs, from the parking garage two levels below ground to our condo on the fourth floor -- basically a five-story climb. I couldn't hold both boxes at once, but didn't want to take two wholly separate trips, so I would carry one box two or three flights and then go back for the next, going one or two flights further up in turn. And within maybe an hour after that, the requisite Christmas Living Room you see in the middle image in this post was done. I didn't even get to the day's photos until after that, and I was up until a little after midnight, for some reason more wired than tired until then. So that leaves Sunday, when Shobhit and I met up with Laney to see Widows -- a movie I waited more than a week after its release to see, just so Laney could see it with me and fit it into her own busy schedule. Shobhit actually left much earlier than I did, because he wanted to be the first 100 people at Cost Plus World Market and get a $10 off coupon. I guess he got a bunch of my stocking stuffers there. He also did plenty of other shopping, meeting up with Laney and me at Pacific Place with several shopping bags in his hands. I met Laney, on the other hand, at Pine and Summit, and we walked the rest of the way downtown together. Somewhat to my surprise, she had suggested walking instead of taking Light Rail, which she had not done in a long time. I got to the intersection well before she did, giving enough time for a panhandler to approach me seconds after letting a wet fart. Fun! The movie was very good, albeit not quite as thrilling to watch as I kind of wanted or expected. It still reveals it to be better as a film the more you think about it, though, so it warrants the B+ I gave it. Laney did take Light Rail home afterward, but Shobhit and I parted ways, as we had more stores to go to: H&M to exchange a pair of shorts he got there on Friday for dirt cheap on Black Friday but had the wrong size; then to Veggie Grill to get their $30 gift card deal where they add an extra $10 to it, which we used to buy ourselves lunch -- although we got the dish to go and ate it with leftovers from Thanksgiving for yet another rather heavy lunch at home. I then wrote my review, and after that we walked to the QFC on Pine and Broadway to make use of so many digital coupons that we "saved" something like $47 and I spent all of about $22. We got a lot of crackers and pasta sauces out of it, among other things, but a lot of that stuff we'll bring for snacking with Mom and Bill when we visit them in Idaho in a few weeks. After all that was done, and I had laundry underway, I was finally able to change into pajama bottoms and lounge around for the rest of the day. In lieu of dinner Shobhit and I had several slices of buttered bread from a loaf he bought earlier in the day at Pike Place Market. And we watched my Netflix DVD of When Harry Met Sally..., which really is a funny movie. And that brings us to today, and my having just returned from lunch with Karen at the Six-Seven Restaurant at the Edgewater Hotel, this being rescheduled from the usual fourt thursday of the month because in November that's always Thanksgiving. Conversation was lively as always, catching up on respective holiday doings, and I had to get back slightly more quickly than usual due to being scheduled for a meeting, which I need to be in soon so I should post this.